Despite the prime minister being unaware of the problems patients face when making advanced bookings, the issue has not come out of the blue. Anger over the 48-hour target for GPs to give patients appointments has been simmering ever since it was introduced last year. But it has reached boiling point after Tony Blair was harangued on BBC's Question Time on Thursday. Diana Church, who raised the issue on the show, said: "I can understand them trying to use targets in order to get a better service, but when it is so slavishly followed that is a problem." Doctors have long complained that many of the government's NHS targets distort clinical priorities. And the 48-hour GP wait is no different. Dr Hamish Meldrum, chairman of the British Medical Association's GPs committee, said: "If you have to make more appointments available on the day or following day that means there are less appointments available for forward booking, particularly in stretched areas. "It has taken away from GPs what they always wanted to do and that is to prioritise appointments on the basis of need." The Royal College of GPs has also been critical. Last year the college released a report claiming the target was too simplistic and should be scrapped. Doctors have said the target takes away their ability to accept appointments on clinical need as they are forced to see both someone with a sore throat and an urgent cases within two days. 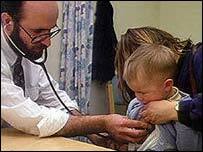 Dr Peter Holden, a GP in Derbyshire and senior member of the BMA's GP committee, said the target was a "nonsense". "We have always seen urgent patients straight away. The difference is that in the past when someone with a sore throat rang up and we gave them an appointment in a few days, they would often not need to come. "Now we have to see them much sooner and that means there are less appointments for people to book ahead." If family doctors do miss the target they face losing money. Under the new GP contract practices are paid a bonus linked to how well they perform - the access target is worth £9,000 a year for the average practice. Faced with the prospect of losing money, a number of practices - doctors' leaders put it as high as one in five - initially stopped offering advanced bookings. But Dr Michael Dixon, a GP in mid Devon and chairman of the NHS Alliance, which represents primary care, believes the situation is not as bad as it was then. At first his practice scrapped advanced bookings, but reversed the decision after complaints. "I think practices have begun to realise that it is not popular with patients and have stopped doing it. "It is a shame if some GPs are still doing it, it is not in the best interest of patients." Dr Dixon also has some sympathy for the government, pointing out patients often faced a long wait for an appointment. 99.9% of patients can now see a GP within 48 hours. Department of Health figures show 3.6% of GP practices do not have advanced bookings - down from 12.4% in November. John Reid said the number of surgeries not offering such bookings will fall to 2% in April. The target was proposed in the NHS Plan after ministers said some patients were having to wait more than eight days for an appointment. Dr Dixon said: "Long waits are now a thing of the past, so that is a good thing for both patients and GPs." Department of Health figures show that 99.9% of patients are able to book an appointment within 48 hours and only 3.6% of practices are not offering advanced bookings. Health Secretary John Reid said before the government acted it was a "thoroughly unsatisfactory" as there was such long waits. "That situation has been transformed," he added. Joyce Robins, co-director of Patient Concern, which has been campaigning on the issue, said the number of practices not offering advanced bookings is actually increasing as GPs are coming under pressure from PCTs. "We have had complaints from all over the country from patients who can no longer book appointments to fit in with their work or family schedule and can no longer book to see their own GP."